Automatically block out travel time, allow repeat bookings, get alerts of last minute changes via SMS, send automatic reminders to reduce no shows, and more. so there’s no need to configure settings for your schedule to be used on a mobile device. Reduce admin by automating your booking process to let students self-schedule and pay online. Set buffer times. No need to constantly block travel time between lessons, your schedule can be set to automatically do so for you. Configure alerts that notify you when new bookings, or changes to existing bookings, are made. Make booking parameters. Save time by predefining how and when customers can schedule their lessons. Students can also make repeat bookings in one easy step. Add payment processing and integration. Add online payment collection during the booking process. You can also link your schedule to your Google Calendar so that personal appointments are automatically marked as unavailable on your SuperSaaS schedule. Give instructors control over their own schedules. You won’t need to create a new schedule or multiple schedules if you add staff to your business. 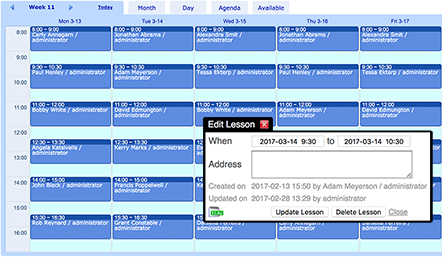 You can simply add more instructors to a single schedule and give them superuser access to facilitate or supervise bookings. SuperSaaS matches your style. You can also keep your branding consistent by adding your own logo and configuring the color scheme to match. Or you can go one step further and integrate your schedule into your website or Facebook page. I have been using SuperSaaS for approximately three years to schedule diving lessons for our driving school. It instantly became an effort free process. I would highly recommend this service to anyone who has needs for scheduling. SuperSaaS is extremely customizable. Allowing students to schedule their driving lessons online is very important. No one compares to SuperSaaS with online schedule customization and options. Going with SuperSaaS was one of my best decisions. SuperSaaS is a reasonably-priced product that provides a lot of flexibility for students to make and change their own bookings, usually with minimal assistance from us. Our students like it because they can see the real-time schedule for lesson availability, and it allows them to process their bookings at any time of the day even if our office is closed.